Let’s face it, we all really love cool stuff. In our day to day lives we may choose to be more practical or we may prioritize our cool stuff. Are you a car person? or are you all about the designer purse? Admit it! We all have that item that is a must for us. Here at CHBO we talk a lot about having the best possible photos to allow potential renters to fall in love with your corporate rental. After being in the business for a number of years even I sometimes forget the basics. 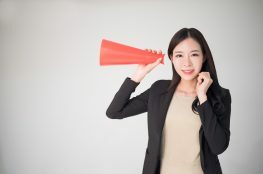 A rental property I had in San Francisco had been rented non-stop of 10 years so I was very surprised when it became available and was not re-rented. After a while I decided to fly to the city for the weekend and take a look. The reality was the property was out of date and needed a facelift. I painted an accent wall, updated the paintings on the wall and did a general “Fluff Patrol.” Guess what, the next tenant who viewed the property took it and paid $750 more per month than the previous tenant. YES, the little things count for a lot. Now that spring has officially arrived, we’re getting ready to take our corporate housing entertaining outdoors. 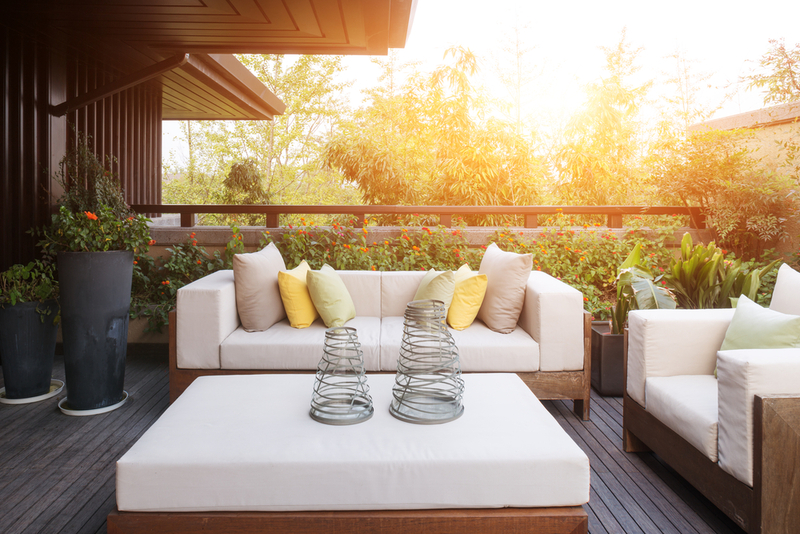 Spruce up your furnished rental home’s deck this season to create an inviting space where your tenants can kick back and relax. We’ve chosen four of our favorite decking decor tips that are both functional and stylish, so your tenants can feel right at home. Before you set out on building a beautiful deck, it’s always best to take in your surroundings and decide how you can best accentuate what Mother Nature has already built. Is your corporate rental located on along a mountainside, or is it coastal? Build your deck around trees, through an open field or facing a lake to make the most of the views you already have. If you have an incredible view from way up high, we suggest building a longer deck as a sort of lookout. Tenants can use this perch as a personal viewing area, a place to take in a starry night, or a spot for morning meditation. We cannot stress this enough: Construct a deck that complements your rental as it is. If the home has hard lines and modern touches, don’t build a deck that is best suited for a cabin in the woods or a Tudor-style mansion. 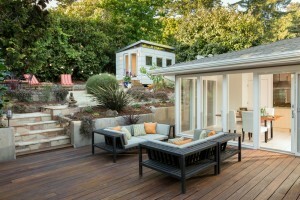 Adding a deck is a great way to extend your home’s existing style outward. 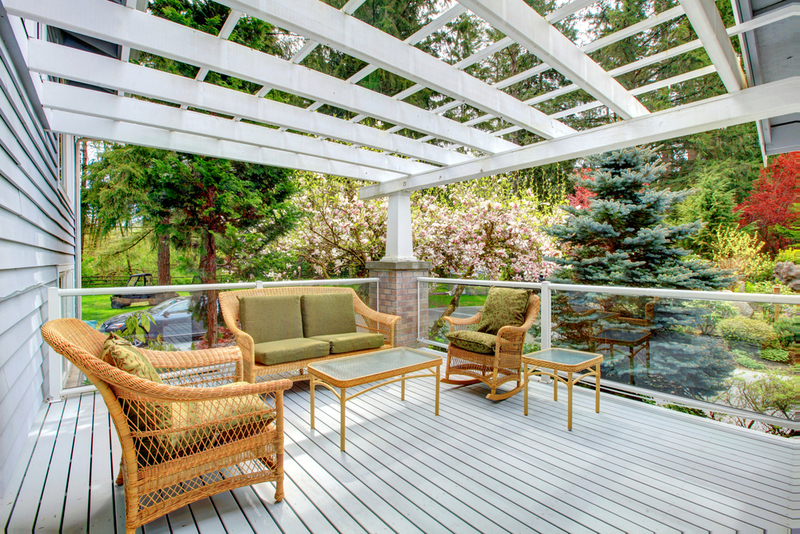 Use your deck to accentuate your home’s best features and show off its bones. Is your modern corporate rental minimally furnished and dressed in cool colors? Great. Use the deck to warm up the rental with greenery and add wood elements to balance the modern vibe. 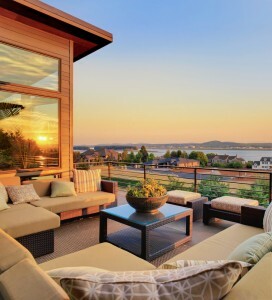 Now that you’ve chosen materials and design concepts that complement your home, it’s time to take a step further and make your new deck comfortable and inviting. 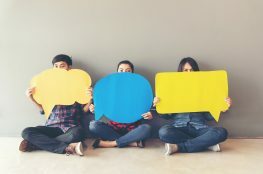 Most tenants seek out corporate rentals to get away from their daily lives and find a home-away-from-home. 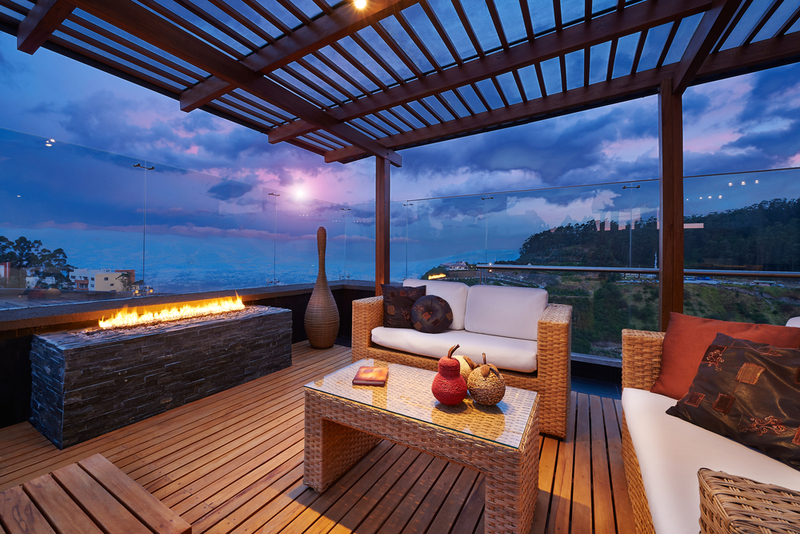 By adding elements of comfort and luxury to your deck, you’re giving your tenants a chance to escape from reality and relax. When choosing furnishings and accessories to complement your newly constructed deck and fenced areas, think about colors and materials that echo your style and that of your renters. Look into sectionals, chairs, rockers and built-in furnishings like tables and outdoor kitchens to create a relaxed, vacation-like vibe. Bring your new deck’s style home with accessories and decorative accents. First and foremost, your deck needs lighting. Choose string lights, hanging pendants or outdoor lamps to illuminate your space and create an ambiance no renter could resist. Second, add plants and flowers to promote well-being and liveliness within in the space. 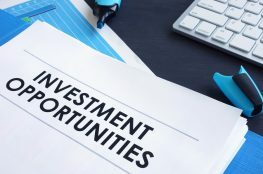 Tenants at corporate rental homes love looking to nature for inspiration and relaxation, and what better way to do that than by investing in potted plants, topiaries and built-in gardens? 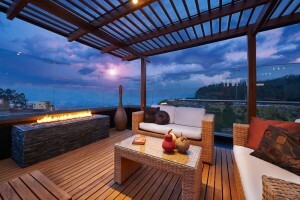 Lastly, add decor and accessories that emphasizes the deck’s surroundings and plays up the inside of the home as well. Line any stairs or doorways with lights or candles, create comfortable spots with fire pits and furnishings, and emphasize an outdoor eating area with a beautifully decorated table and seating arrangement. 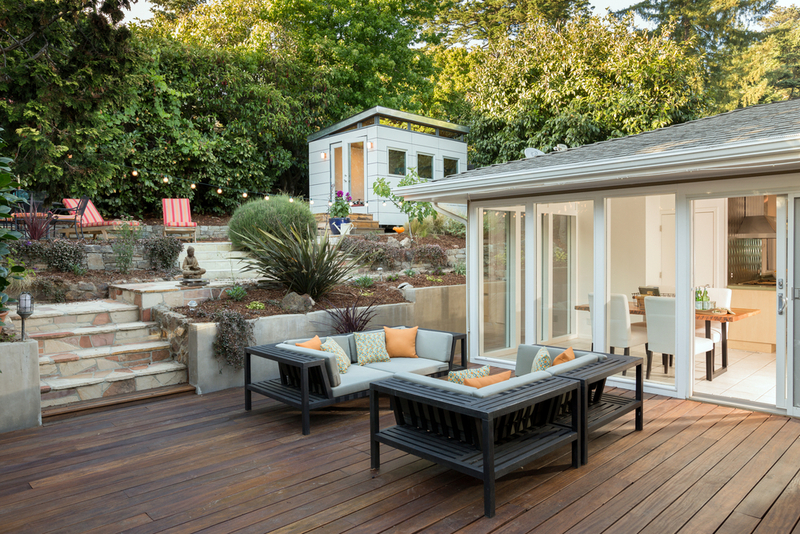 Building a deck that will impress your renters and make them feel at home is one of the best ways to keep tenants coming back to your rental year after year. How will you upgrade your rental’s deck? Kerrie Kelly is an interior designer who provides design advice for spaces both inside and outside your home. She gives advice on how to extend your indoor style seamlessly into the outdoors with a new deck. To learn more about planning your deck and deck material options, visit The Home Depot. Read more about how to setup a corporate housing rental in The Corporate Housing Handbook from CHBO. Managing a property seems like it could be tricky. To me, it seems like the hardest thing to do would be selling units. So, I like that you talked about how to make a place inviting. That way you can get more people to look at and want to stay in your property. Very good information. Every corporate companies need to follow this strategy. Regular maintenance is very important to keep corporate desk clean. Fantastic advice for styling your corporate rental. Accessories are your friend here. They really help the space feel homey. Don’t forget the bowl with little wooden balls in it or it won’t be a real corporate space.